Introduction: Though the term “pet” did not exist in the Middle Ages, the concept of the “pet” or “companion animal” has been tantalizing for animal studies across historical periods due to such an animal’s position in human space and its potential for cross-species identification. Indeed, the field of critical animal studies traces its origins to Jacques Derrida’s thoughts on his own pet cat in The Animal That Therefore I Am. Unsurprisingly, then, given both that critical origin and the pets common today, much of the interest in medieval pets has centered on dogs and cats kept indoors. One of the most recent monographs on medieval pets, for instance, specifically emphasizes the idea that “their true milieu [is] enclosed domestic space,” and it focused particularly on small companion animals kept by “women, clerics, and scholars, all of whom shared an indoor lifestyle”. Historical and literary evidence illustrates, however, that people in medieval England sometimes also kept deer as pets, even indoor pets. Although these domestic deer were probably status pets and may not have occasioned the same sort of emotional attachment as a dog, they encourage modern scholars to think more broadly about medieval pets. These domestic deer, along with their half-tame compatriots kept in deer parks and their literary doppelgangers, illustrate that deer were for many medieval people an important “contact zone” with the animal world, one that reveals an intense spatial engagement with cervid bodies and an equally dense empathy with the cervid mind. In contemplating, hunting, and keeping deer, medieval people attempted to see the world through these animals’ eyes and even on occasion imagined harmonious possibilities between the human and non-human. These models contrasted dominant ideologies based on medieval theological and philosophical distinctions between humans and animals, and deer-keeping in particular provided an exception to a broader culture of violence toward animals, one that through the control and consumption of animal bodies maintained what Karl Steel has referred to as the “structural position” of the human. 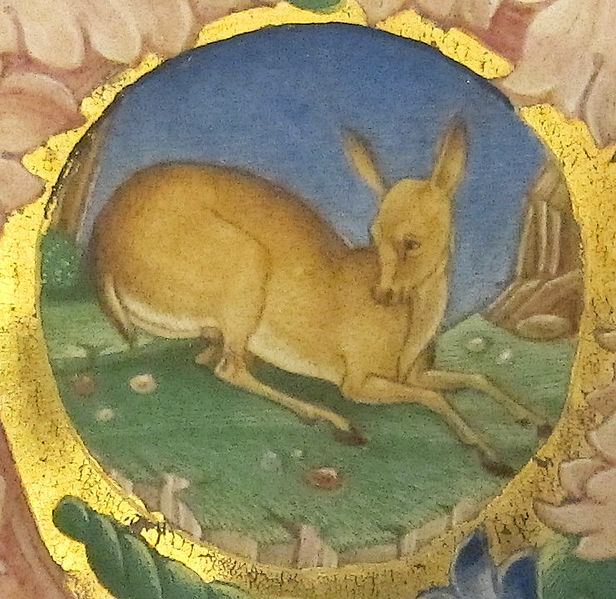 Medieval deer are often thought of today in terms of their symbolism, usually in the context of secular romance or religious allegory. Gerald Morgan, for instance, treats them in just such a way in his recently reprinted article on the hunting scenes in Sir Gawain and the Green Knight. Sometimes deer are also described as ciphers in complex deployments of elite hunting terminology, as Ad Putter and David Scott Macnab have illustrated. Deer are, of course, also frequently regarded as living game animals or as an uncommon form of livestock kept in hunting parks, a subject on which Jean Birrell’s contributions are particularly notable. On occasion, they have also been the objects of fascinating zooarchaeological investigations, as in Naomi Sykes’s work. Medieval deer, however, are also open to critique as pets. We know from a letter circa 1280, for instance, that John of Maidstone paid a visit to Gregory de Rokesle, then mayor of London. With him, he brought some writs from court, which he left on a counter in Gregory’s chamber, presumably for his review, before they were dispatched to Boston and elsewhere. This routine matter was disrupted, however, when a hart (the male red deer), which was in the house, entered the chamber and devoured the writs. The mayor was forced to write to John de Kirkby, the keeper of the chancery rolls, to ask for duplicates.